"It was a black reality, an empire of black magicians, steeped in evil now long forgotten. It was finally overthrown by the Hyborian tribes of the west. The wizards of Acheron practiced foul necromancy, thaumaturgy of the most evil kind, grisly magic taught them by devils." 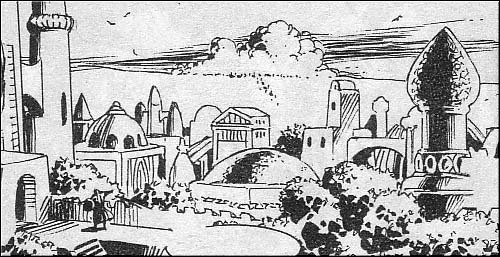 -- Robert E. Howard: "Hour of the Dragon"
An ancient kingdom, extinct in Conan's time, founded by a northern offshoot of the Lemurian survivors several thousand years after the Cataclysm. Its area roughly corresponded to Aquilonia, Argos, and Nemedia, and its dominion later extended over western Koth, Ophir, and Corinthia. The latter three nations were also under the hegemony of Old Stygia at one time, apparently falling to Acheron at a later date. It seems likely that Acheron overextended itself by annexing these Stygian satellites, leaving its northern frontier vulnerable to the subsequent Hyborian invasions. The exact chronology of Acheron is shaky; but it seems to have flourished for about 2,500 years, a theocracy under the control of wizards. The barbarian pressure of the more vigorous Hybori pouring down from the north ultimately destroyed Acheron. Its demise took place 3,000 years before the time of Conan. The resurrected wizard Xaltotun attempted to restore the ancient kingdom, but was frustrated by Conan. Python: So-called City of Purple Towers, ancient capital of the evil empire of Acheron, its extent was ten times that of Luxor, Old Stygia's greatest city. References: Hyborian Age I, Hawks over Shem, Black Colossus, Conan the Buccaneer, Hour of the Dragon, Conan and the Treasure of Python, Conan and the Grim Grey God, Conan the Bold, Conan the Rogue, Conan and the Emerald Lotus.